This is a puzzle. However, we have an on-the-site reporting of Indy Week’s Adam Sobsey, who spent two days exploring the wilds of Fort Mill, SC and Knights Stadium, to try to explain it all. Take a look at the links above. Let’s step back and look at the last two five game chunks (two times through the pitching rotation). We see a 4 win - 1 loss chunk (starting pitchers: Hernandez, Phillips, De Los Santos, Vasquez, Baker) followed a 1 win - 4 loss chunk (starting pitchers: Hernandez, De Los Santos, Vasquez, Phillips, Hernandez). Missing, obviously, from this 10 game run is prospect Jeremy Hellickson, who apparently was stressed out by his two inning, 25-pitch appearance at the Futures game on 11 July. 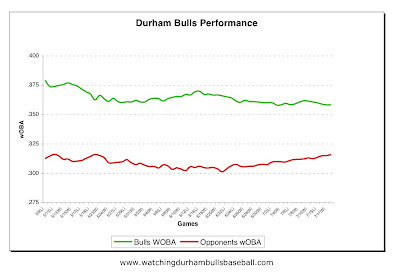 It is obviously the case that the Futures/All-Star shows have disrupted the Bulls a good bit. By now, of course, you would think that there’s been enough time to recover. Even Mr. Hellickson should be ready for tonight’s encounter with Cleveland franchise, the Columbus Clippers. If we want to worry, however, take a close look at the red line in this chart. 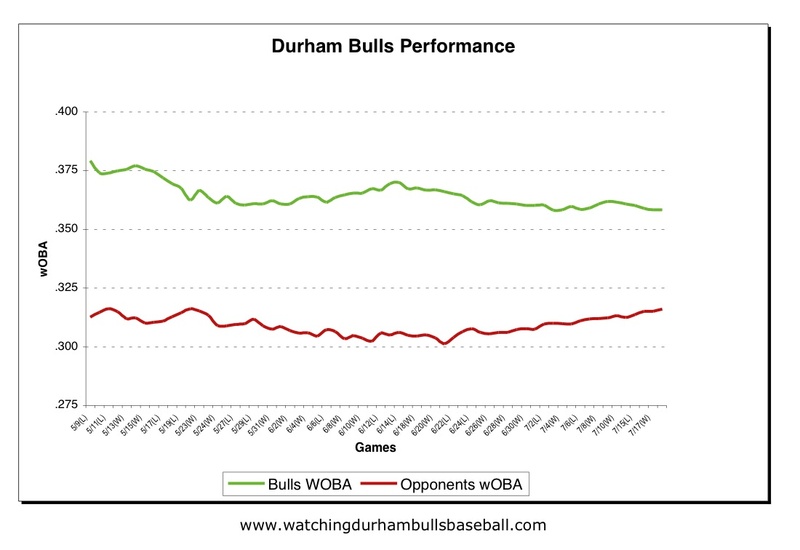 That’s the cumulative wOBA of our opponents. There’s a big gap between the red and green lines (that’s good). But, the red line is creeping upwards. At this point in the year, that is definitely not good. Essentially, what’s being measured there is the performance of our pitchers and defense over the year. We need to worry about that trend. In the meantime, we don’t have to play Charlotte until 10 August (we play them 10 more times this year). That’s good. It gives us some time to get back on track. Columbus is a good team. If things were to stay on track, we’ll see them in the playoffs. Should be a fun, if warm, couple of nights at the DBAP.